The beauty of Northern Nigeria,culture and facts explored by Pelu Awofeso. Do you know much about Norther Nigeria?The culture?Facts about the region?Travelling around Nigeria has never been simplified the way Pelu Awofeso is doing. He has visited 32 states in Nigeria documenting several indigenous festivals and carnivals on his own account. Beyond crisscrossing the country, he has won the prestigious CNN/Multichoice African Journalist Awards in the Tourism reporting category, he is the publisher of WakaAbout magazine, and also a contributor to several leading news platforms. Awofeso tells Jumia Travel, about his travelling experiences and much more. Enjoy! (Plateau State), after which I moved to Africa Today as Arts & Travel Correspondent, Network Africa (as Editor) and National Daily (as Travel Editor). In the past decade, I have written for both local and international publications, some of which include: World Policy Journal (US), Travel Intelligence (UK), A24 Media (Kenya) and NEXT (Nigeria). My most recent freelance engagements have been for thecable.ng, Naij.com and WINGS (inflight magazine for ARIK Air). I am a winner of the CNN/Multichoice African Journalist Awards in the Tourism reporting category. You are a foremost travel journalist and enthusiast, can you tell us how you developed your love for travel? It all started when I made my first visit to Jos as an adult. It was my first journey outside of the southwest region and seeing the majestic hills, experiencing the cold weather and interacting with the indigenes made quite an impression. Shortly, I learned that Plateau State had many tourist attractions so I began to visit them one after the other; I couldn’t have enough and I travelled some more and thereafter began to write a weekly travelogue which was published in the local newspaper. That’s how my travel adventures and journalism career kicked off. How many states have you toured? Can you describe one of your most outstanding experiences? I have travelled widely around Nigeria—32 states at the last count—documenting several indigenous festivals and carnivals; my other travel interests include museums, monuments, nature, crafts and the daily pursuits of everyday Nigerians. An experience that will stay with me for a very long time is visiting the Biafra Bunkers, now part of the National War Museum in Umuahia; it is underground and you have to navigate the space with a flashlight. It is a bit scary, but it helps one to imagine what the civil war years must have been like for the immediate community. What will you say to those who prefer to travel out of Nigeria for vacation? There are a hundred and one vacation-friendly locations around Nigeria and it is high time Nigerians realized this fact and cease to whine about poor infrastructure; the beauty of Nigeria is in its cultural and physical assets and not in manmade structures. It is okay to travel the world and make a statement about it but it is a misnomer if you haven’t first explored your country. The majority of Americans travel around America, and a recent statistics show that nearly 50% of Kenyans travel and vacation in Kenya. 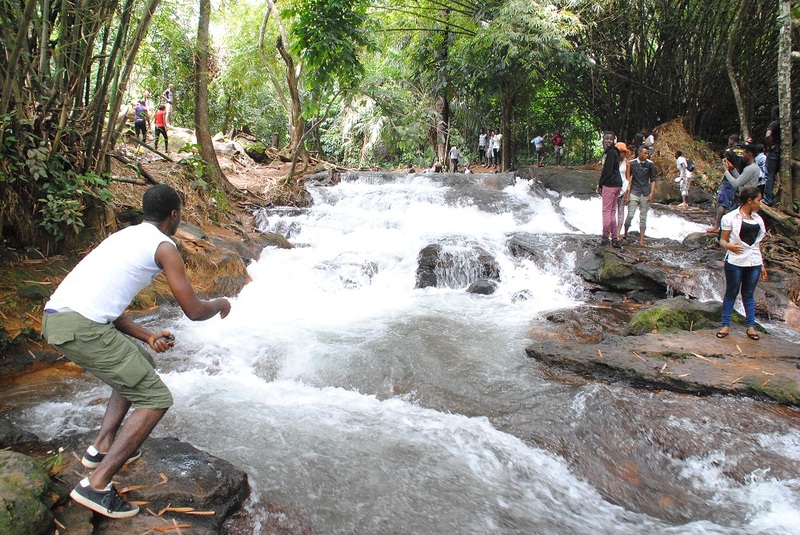 Practically speaking, how do you think the government can develop the tourism sector to attract more tourists? First, it has to plan and carry out a massive re-orientation programme, because Nigerians are unrepentantly dismissive of Nigeria—they never speak well of the country, at home and abroad. I understand the frustration we all feel with the way the country has been run over the decades, but the solution is not in running down the country. If the government can get Nigerians to love the country and appreciate domestic tourism, then it won’t be long before foreign tourists would flood the country. The local music and movie industries are perfect examples to learn from. They have become multi-million dollar enterprises because of a huge patronage by Nigerians first of all; the rest of the world then followed our cue. Is it possible to travel within Nigeria on a slim budget especially in this trending economic recession? Absolutely. The truth is that there is a growing number of Nigerians now travelling more within the country because of the recession—on day tours, short vacations, and retreats. Travelling abroad for vacations has become a lot more costly; local travel is the fall-back alternative. What advice do you have for people who are traveling to Northern Nigeria? Northern Nigeria is vastly beautiful and most of its traditional lifestyle and practices and indigenous architecture are still unspoiled. I encourage more people to visit the region, except the crises prone areas. Can you tell us about the travel projects you are currently working on? I juggle multiple projects all the time. I am working on two travel books this year, while also promoting a travel writing contest titled “My Nigeria Travel Story”. It is my own way to help grow the appreciation of domestic tourism. What advice do you have for aspiring young travelers? They should be bold, pack their bags and go—there is a whole lot to see and savour in Nigeria. Besides, travel is another way to learn about the world around us. I started to travel around the country from when I turned 25 and I have not stopped travelling. I have enjoyed all my trips to date and I am a better person because of my travel experiences.